It’s 5 o’clock, you’ve almost hit your 60-gram daily macro limit for fat, and you haven’t had dinner yet. What’s a macro counter to do? 1. You can go over on your fat macro that day. 2. You can eat foods that are free or very low in this macro. In this article, I’ll give you suggestions on what to eat if you run out of a particular macro and I’ll explain why going over on a particular macro from time to time will not hinder your overall progress. Here are some foods that are rich in protein but free from all or most of the other macros. Use these foods when you need more protein but have already hit or are coming close to your limit on carbs or fat. Pure Whey Protein Powder: This is great to have on hand and choose brands that have zero carbs and fat or brands that have very little of the other macros. Brands like Isopure and BioSteel are zero carbs and 1 gram of fat per serving. Very Lean Chicken Breast: This is only about 1.5 grams of fat per serving and could be even less if you remove any visible trace of yellow chicken fat before you cook it. Atlantic Cod: 0 carb and .8 grams of fat per serving. Orange Roughy: 0 carb and .8 grams of fat per serving. Mahi Mahi: 0 carb and .8 grams of fat per serving. Egg whites: 1 egg white provides just a trivial amount of both fat and carbs but 3.6 grams of protein. Turkey Breast: Roasted turkey breast is just .8 grams of fat per serving and has 0 carbs. Crabmeat: Alaskan King Crab is just .8 grams of fat per serving and zero carbs. Just skip the dipping butter! Here are some foods that are rich in carbs but free from all or most of the other macros. Use these foods when you need more carbohydrates but have already hit your limit on protein and fat or are about to. While it would be simple to just eat tablespoons of sugar, I’ll focus here on healthier carb-rich foods. Fruit: Most fruit is almost fat-free and very low in protein: Here are some to choose. Banana: A medium-sized banana has less than .5 grams of fat and only 1.4 grams of protein. Apples: A large apple has less than a gram of both fat and protein. Blueberries: A cup has .5 grams of fat and only 1 gram of protein. Strawberries: A cup of strawberries has less than .5 grams of fat and only 1 gram of protein. Pears: A large pear has a trivial amount of fat and less than a gram of protein. Honey: While honey is mainly pure sugar, it does offer some good health benefits1 so use this as a carb boosting sweetener when needed. Sweet Potatoes: A medium sweet potato has a trivial amount of fat and just 2 grams of protein, but 23 grams of healthy carbs. Butternut Squash: A cup of roasted butternut squash is virtually fat-free and contains less than 2 grams of protein. Dried Fruit: Dried fruit is a quick way to boost your carb intake in a hurry. Just choose dried fruits with no added sugar and ones that are unsulfured. Trader Joe’s Unsulfured Apricots: 10 apricots is 50 grams of carbs, 0 grams of fat and only 2 grams of protein, plus 4 grams of fiber. Dried Figs: 5 dried figs delivers 26 grams of carbs, 0 grams of fat, and 1 gram of protein with 7 grams of fiber. Dried Dates: This “as good as candy” dried fruit contains 31 grams of carbs, 0 grams of fat, 1 gram of protein and 3 grams of fiber per 5 dates. This is one macro group that I never have trouble reaching and one that I actually have to work at NOT going over, but I recognize that some flexible dieters may not find it as easy. Especially if you had been stuck in a “low fat” mindset for a long time. Virgin Olive Oil: This monounsaturated oil has been linked to a lot of health benefits2 so use it when possible to boost your fat grams for the day. 1 tablespoon is 14 grams of fat and nothing else. Virgin Coconut Oil: This fat has gained wide popularity over the last 5 years and also has health promoting properties. 1 tablespoon contains 14 grams of fat and no other macros. Grass-fed Butter: Grass-fed butter also packs some nutrition along with the fat. 1 tablespoon is 11.5 grams of fat and has just a trace of carbs and protein. Nuts: Nuts are high in fat, but do contain some protein and carbs. However, the fat they contain is healthy and by far the dominant macro. Almonds: 10 almonds has 6 grams of fat, 2.4 grams of carbs, and 2.6 grams of protein. Walnuts: 1 oz contains 18.5 grams of fat, 3.9 grams of carbs, and 4.3 grams of protein. Pecans: 1 oz delivers 20.4 grams of fat, 4 grams of carbs, and 2.6 grams of protein. For a more in-depth article on healthy fats see this article. 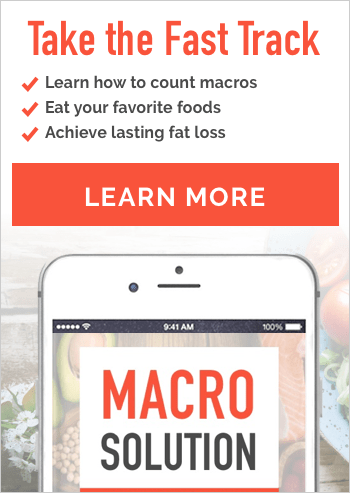 Will Going Over On a Macro Ruin My Diet? Do not stress out if on a few days here or there you are over on one of your macros or under on some others. It will not “ruin” your diet. The most important thing, in my opinion, is to hit as close to your TDEE as possible. Macros are more for “fine tuning” your results, while your TDEE determines whether you lose, maintain, or gain. 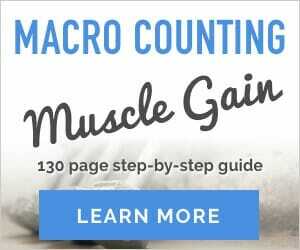 So yes, strive to meet your macros as these will help you reach your goals as far as body composition is concerned, but eating 20 extra grams of fat on a particular day won’t derail your progress unless it puts you 180 calories over your TDEE. Looking for More Food Suggestions? Cicerale, S., Lucas, L. J., & Keast, R. S. J. (2012). Antimicrobial, antioxidant and anti-inflammatory phenolic activities in extra virgin olive oil. Current opinion in biotechnology, 23(2), 129-135. Hi there! I am 27, 5’5 and 142lbs and my trainer has me 55F, 99C, 100P and 1255 calories.. Would those macros be set for loss, gain or what? and I’m slightly struggling to stay within my macros.. Anytime or tips on low macro foods? Hi Kathryn, Those macros would be for fat loss and if you were sedentary. If you are also exercising, which I assume you are, you should be eating more. Sometimes it’s best if your trainer focuses on teaching you to exercise correctly and lets the nutritional recommendations up to an expert. This may be a silly question but if I do not go over my carb macro am I able to have a high carb food? Like steak fries that I have been dying for lol! Hi Nikki, Yes, one of the joys of flexible dieting is that it allows you to have foods that you crave as long as it fits your macros. Have some steak fries! Hi, my daily macros are 171 protein, 196 carbs and 53 fat. If I go over my fat by 20 grams, but I eat like 80 less carbs, is that OK? Hi Joni, if that happens occasionally it’s fine but 20 grams of fat is equal to 180 calories while 80 grams of carbs is equal to 320 calories. You still need to be mindful of your TDEE. For the last few nights I’ve come close to meeting my fat and protein macros, but haven’t come close to the carb macro. I can balance my diet to come closer if I plan ahead better, but my question is this: does the carb macro mostly provide energy? If I’ve made it to the end of the day and am lacking half of my carb macros do I need to go scarf some rice cakes before bed or am I better off going to sleep without it? I don’t want to take away any weight loss benefits, but if the only benefit is energy I’m okay to skip it since it’s bedtime. Does that make sense? Thanks in advance. Carbs are mainly needed for energy but if you have exercised during the day, your body is still working to restore your muscles’ glycogen supplies that were used up during the exercise. You really should get the carbs in to ensure that you are fueling properly and keeping your metabolism humming. Chronic “undereating” can lead to weight loss plateaus and other health problems. Hi Lakelia, Please see our Keto Calculator. Hi Lauren, your numbers look about right, however a lot of it depends on your exercise level and how committed you are to it. When we work with clients we often create two different sets of macros – one for their workout days, and one for their rest days – this leads to better results. I would suggest aiming for the macros you have for 2-3 weeks and see how you go. If you are coming from a keto background then, yes the carbs will seem high – but it’s all about providing energy to help you exercise well. If you aren’t getting the results you want, look at either more comprehensive workouts, or use the Sedentary setting on the macro calculator. Why are you eating such little carbs? Are you doing a ketogenic diet? If so, you need to search for ketogenic food lists. This one is geared more for flexible dieters. I’ve gone over on my carb macros for the day by 24g but hit my protein and fat right on. Can I hop on the treadmill on a high incline to compensate? I wouldn’t stress. 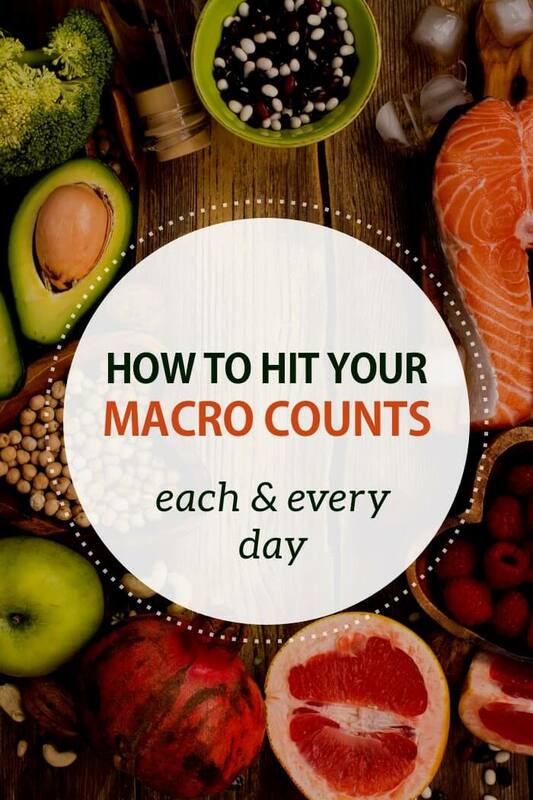 Just reduce your macros the following day by the same amount. How many grams of fiber have you eaten? Only about 40% of your fiber provides calories so it gives you a little cushion if you go over on your carbs. 30g of Fiber today. Thanks so much by the way!! Perfect, so you had at least an 18 g buffer then. Hi there. I’m new to macros. I need help. I’m currently training for a marathon on 4 weeks. 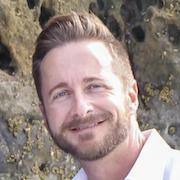 I am 32 and 5’11”, 143 pounds, I calculate my calories to be 2264, and my Macros 283C/142P/63F. Is this right? Help!! I still want enough energy to train and carbs to run long distances. So I did 50%C/25%P/25%F. Hi Lindsay, I would have to know how long your runs are. (time and average speed) and what your goals are before I could comment on whether or not the macros listed would be appropriate. Average speed short runs are 8:30/mile, long runs 9:00/mile. This week we run 5 days, 5 miles, 8 miles, 5 miles, 5 miles, 20 miiles, then it starts tapering. My goals are to improve performance on marathon day and cut some fat. You really should figure out the calorie burn from each run and then add that to your sedentary TDEE to be the most accurate. This will ensure that you are fueling your runs and training properly. You’ll probably need several sets of macros and not just one. Here’s a good resource that can help with calculating your calorie burn from each run. https://www.freedieting.com/calories-burned I would also do just a 10% deficit if you are already pretty close to your goal weight. What about Sugar, is there not a daily # for sugar? The premise behind macro counting is flexibility in terms of food choices. Ideally your carbohydrate choices would be a combination of green veg and other whole foods, but how much of your carbs are sugar is up to you. I go over on my protein every day and under on carbs… I feel hungry all the time if I don’t eat the extra protein..but feel bloated if i eat the correct amount of carbs that had been worked out. Is there any way of adjusting my protein to be higher In my macros ?? Hi Dawn, you are free to adjust your protein and other macros in a way that works best for your body. Here’s the article that explains how the defaults are calculated. You can make your own calculations from there. Gelatin is also pure protein (7g per packet). I make finger jello with unflavored gelatin and herbal tea. Last time I added Truvia (stevia) for a little sweetness, and that made it a bit more palatable. Gelatin is protein from connective tissue and not from muscle meat, which is optimal for building muscle. Gelatin lacks certain amino acids and are a weak source for others in comparison to eating say, a chicken breast. The key amino for building muscle is leucine so to compare 1 serving of gelatin to 1 serving of chicken breast its 524 vs 2652. Long story short, you should not be counting gelatin towards your desired protein goal for the day if your goal is to build muscle.